Cooler temps this week has me pulling out my sweaters and getting giddy for fall crafting. How about you? We made this adorable paper hedgehog craft today and I could not be more excited to share it with you. 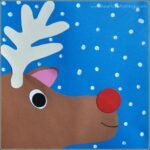 It would go along great with a woodland animal theme at home or school and is perfect for the fall season. 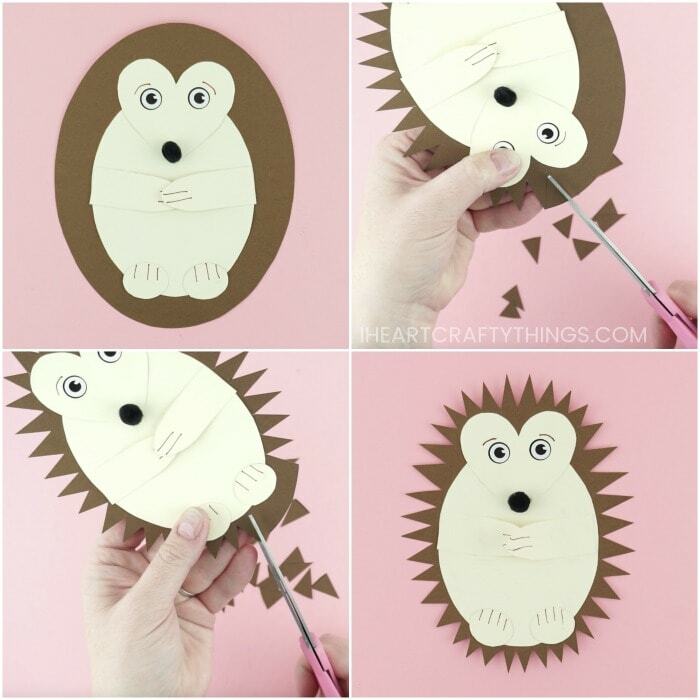 All of the cutting involved in this darling hedgehog craft makes it great for preschool and early education age children to practice their scissor cutting skills. 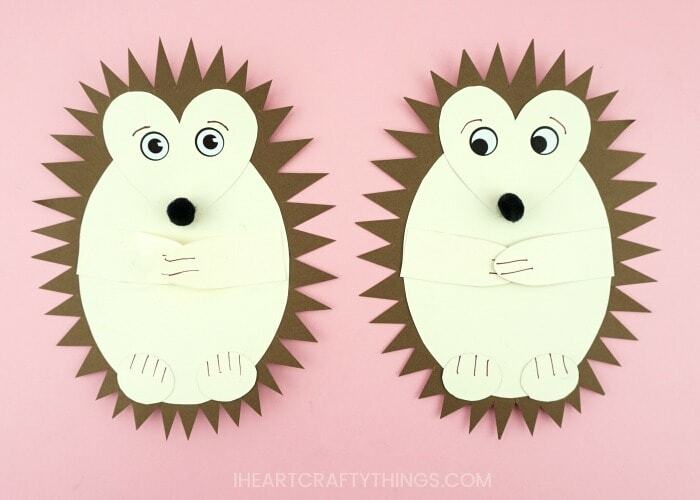 Grab your free template for this cute hedgehog craft in the supplies list below. *We received our black poms from our friends at OrientalTrading.com. All opinions expressed are 100% my own. 1. Begin by downloading the paper hedgehog craft template. Print out page one of the template on tan or cream colored cardstock and the second page of the template on brown cardstock. 2. Cut out each of the pieces of the hedgehog template. 3. Glue the hedgehog head (heart shape) at the top of the hedgehog body. Then glue those pieces onto the brown body spines oval piece. 4. Next glue the arms onto the paper hedgehog along with the oval feet. 5. 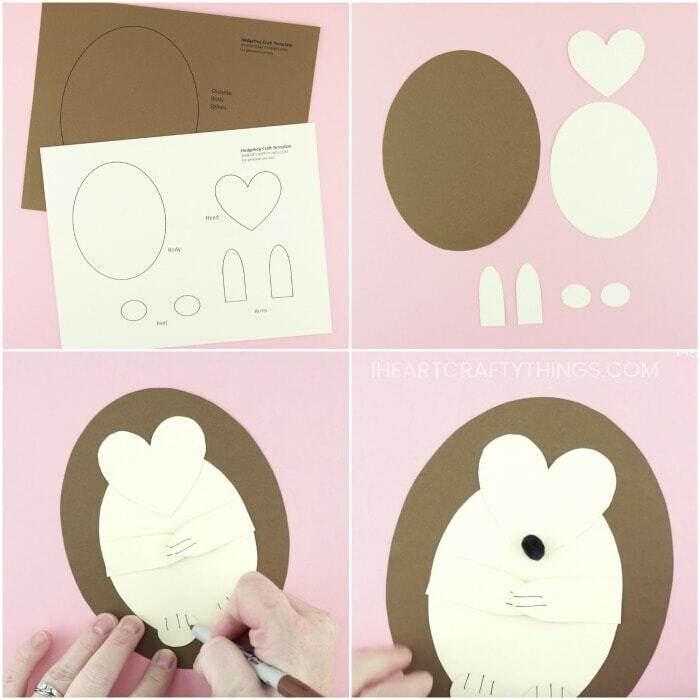 Add a glue dot to the bottom tip of the heart shaped head and then place a small pom onto the glue dot. 6. Add googly eye stickers onto the face of your hedgehog. You can also use standard googly eyes or draw eyes onto your hedgehog with markers. 7. Use a brown marker to draw details to both the hands and feet of your hedgehog. Then if you would like to, draw eyebrows onto your cute little guy to give him some extra character. 8. To finish your hedgehog craft, grab your scissors and cut triangle shapes around the outside edge of the brown oval to create the hedgehog spines. Continue cutting out the triangles completely around the hedgehog. Your adorable paper hedgehog craft is complete! 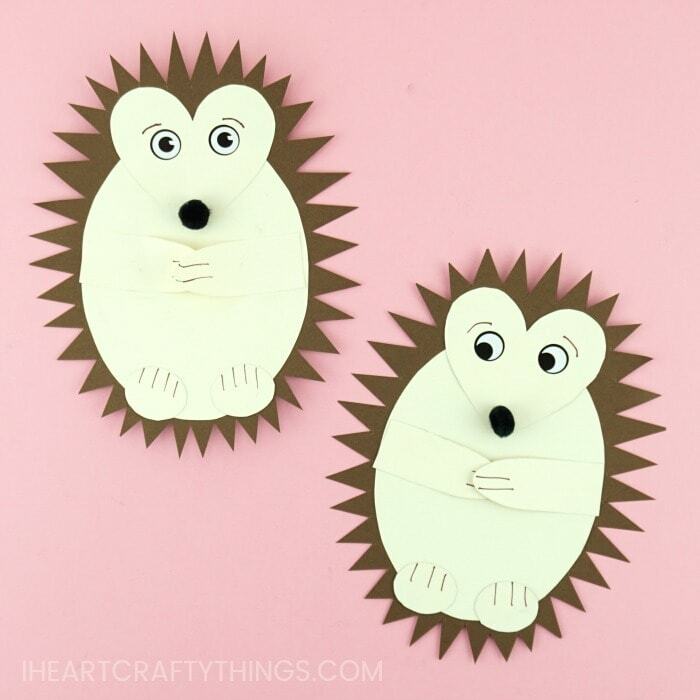 One of my favorite things about this cute hedgehog craft is all of the scissor cutting practice that kids will get from cutting out the different template pieces and all of the little triangles around the hedgehog craft. I also adore how each child’s hedgehog will have it’s own personality with how children place the eyes and the different sizes of the spines around the hedgehog. 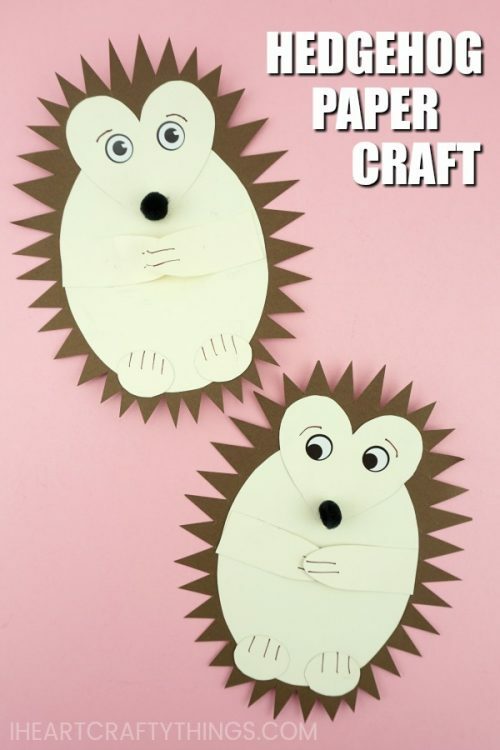 This paper hedgehog craft will look fabulous hung up at home or outside a classroom on a bulletin board for everyone to adore. Skunks are another fun woodland animal to explore during the fall season with kids. 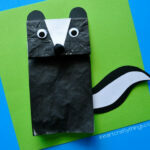 This paper bag skunk craft is cute and super fun for kids to play with as a puppet. Newspaper adds a unique and colorful texture to this cute raccoon paper craft. It is great for the back to school season to along with the book The Kissing Hand. We also have a darling paper bag chipmunk that would be a fun little companion to go along with the skunk. Have a favorite zoo animal? 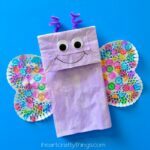 Check out these 50+ awesome zoo animal crafts for kids!